It’s Monday. A smoldering week-long cold zapped my usual strength. This was topped off happily by a healing family weekend at the beach…and Friday turned into Monday. You will find these favorites of the week worth the wait. They sure brightened my week. 1) Game of Thrones on Guitar – Full disclosure: I have never watched Game of Thrones. The glimpses I’ve seen on YouTube are stunning but the Medieval violence (both weaponized and sexual) are halting for me. The music, however, is gorgeous…which I can enjoy without watching the popular series. On the eve of the start of Season 8 (and the final season reportedly), Nathan Mills, of Beyond the Guitar, has released his arrangement of the Game of Thrones theme (“Light of the Seven”). Watch and enjoy here. 3) Legacy Beyond Career – Basketball. This week marked the final game of the NCAA Basketball Tournament. Between college and professional basketball, there’s a lot to watch on TV…including great commercials. During the final game of the NCAA tournament, we watched University of Virginia finally defeat another great team (from Texas Tech). It was exciting! 4) Privilege – Again, maybe because it is the height of basketball season, I came across an insightful essay on white privilege by professional basketball player Kyle Korver. Growing up, I had determined to be color-blind myself, but it was naive and hurtful, on my part. To be honest, white privilege is a phenomenon I’m just coming to terms with… Kyle Korver’s essay, from the standpoint of a white person looking at privilege from a close and intimate vantage point, is a good place to start. 5) A Stack of Books – Kindergarten registration was this week around here. It dawned on me that in one year, my wee oldest granddaughter will be the age to register. Yipes! She loves to “read” already, having the daily experience of books read to her by mommy, daddy, and whoever else will open one with her. After seeing his stack, I pulled together (from various parts of our house) the books I’m currently reading. How about you? I would love for you to post (in the Comments below) a picture of your current stack of books. I would say something about having a great weekend, but now it’s Monday. Let’s get to it! Blessings always and thanks for reading. You know the story…how fast this week (this month, this year) is flying by. No time to waste. So let’s get right with it. Five of my favorite finds this week. Reading Wars – What does that even mean, right? It’s the title of Philip Yancey‘s captivating article on waging battle on the mental clutter that crowds out even the possibility of deep thinking. What is our weapon against the onslaught of shallow that we expose ourselves through social media, email, and texting communication? Reading. Reading for learning. So simple and yet how many minutes a week do we commit to it? Sure, we can learn from what we find on social media. My friend Ann Lovell pointed us to this article through her Facebook page. If I just scan the article then I continue to “not” learn from it…as happens with most of the content that shows up in my various newsfeeds. This time…I’m taking it to heart. Yancey points out several cultural powerhouses who commit to a mininum of 5 hours of reading a week. I am joining them. Thanks, Mr. Yancey. Thanks, Ann. [Sidebar: Whole cultures in the world prefer oral vs. written information delivery. Deep, detail-rich, reproducible storying. I wonder how these cultures are changing because of the same short-cut habits of sharing information we have developed here in the West. What do you think? 2) Lord of the Rings on Guitar – Nathan Mills of Beyond the Guitar posted another of his arrangements this week. This one is from the legend Lord of the Rings Trilogy. You who love LOTR as much as I do will recognize The Riders of Rohan. It is another great orchestral piece translated by Nathan to classical guitar (like Beyond the Guitar‘s recent Game of Thrones arrangement). Just beautiful. Takes us back to the glorious battles of Lord of the Rings. After seeing the video below comparing “Walking in America & Walking in South Korea” I am glad for an easy neighborhood to walk in. However, it’s also clear how those in huge cities make do, with walking and staying healthier. I wonder, if our civilization is around for another 100 years, what will be in our natural and civil history museums? There could be a gap with all the “stuff” that will go eventually into today’s landfills. Would love to hear your thinking on this…as one of the many with unwanted treasures. Just this week, I heard her sing Unchained Melody. Still magical. Her lovely simplicity in demeanor and her mesmerizing voice are a powerful combo. Do you know what happened to her? She’s still out there and is now a wealthy woman still living in her small family home in West Lothian, Scotland. She had a dream…and it came true. Her life inspires us all. Happy Weekend. Be safe and be inspired…so much to enjoy in this life and to take joy in…even in the hard. There’s a precious little girl in my life who calls me “Ga” (because she can’t yet say “Gram”). Not even 20 months old, she has learned well how to use her tiny index finger to point for us to take her wherever in the house or yard she wants to go. She demonstrates her mastery of body parts by pointing that finger to her eye, nose, mouth, etc. when we call out the word. Just recently, she holds up that singular wee finger when identifying the number “win”. Unfortunately, I am a culprit contributing to the delinquency of a minor…no, no. Not that…but I have contributed to her developing that index finger further in playing with my smart phone. She knows how to scroll through pictures and she knows how to tap the “play” icon to start up videos. Is that so horrible? What’s the harm? My confession comes from a place of discovery. The problem is not that this toddler likes looking at pictures of her family on my phone. That has to be a morally neutral (even positive) thing. Also not a problem is her fondness for her Uncle Nae’s music videos. She has her favorites and daily asks to see those (Dayman and Have Yourself a Merry Little Christmas)…among others…several others. The problem is when she doesn’t get her way. When Mommy intervenes or when Gram comes to her senses about the amount of screen time she’s facilitating. Then this funny, sweet, curious little girl flings her head back, attempts a body-slam, and emits a piercing angry cry against those who would keep her from her screen(s). Morally neutral or even positive goes out the window at that point. Given her reaction, when does something soothing and enriching like family photos and videos cross a line…out there in a few kiddie years…to a screen or internet addiction? I don’t think I’m over-reaching here. There is balance absolutely, but if we don’t even consider the risk, we won’t take steps to keep screen use healthy for our children/grandchildren. I’m dealing with this in my own head right now…and in my habits. My personal revelation today came on the reading of Dr. Nicholas Kardaras‘ New York Post article It’s ‘Digital Heroin'” How Screens Turn Kids Into Psychotic Junkies. He advises parents to be cautionary in guiding their children’s use of technology and the internet. Many parents intuitively understand that ubiquitous glowing screens are having a negative effect on kids. We see the aggressive temper tantrums when the devices are taken away and the wandering attention spans when children are not perpetually stimulated by their hyper-arousing devices. 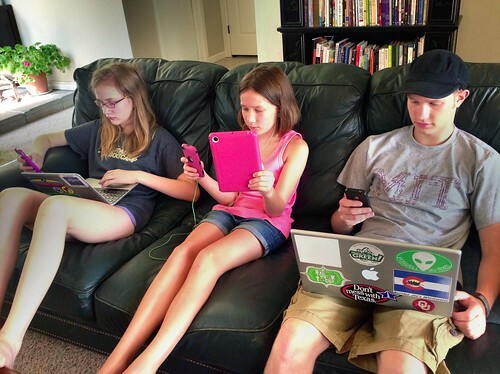 Worse, we see children who become bored, apathetic, uninteresting and uninterested when not plugged in. But it’s even worse than we think. I was reminded of when our boys were middle schoolers. A friend of theirs came over to spend the night. They played video games for hours. When we finally told the boys to take a break, the friend actually became more and more anxious, even to the point of not being able to get his breath. We had to take him home. Now all toddlers are not going to end up heroin…I mean, tech junkies. Again, there is a balance in how we determine what’s a healthy use of electronic devices and where limits need to be set. It’s just something to think about. My confession here relates to the personal struggle I have with internet dependence. I was a late adopter of smart phones (my first being in 2013). At the time, my job was a communications strategist for a new work team. Managing a blog, Twitter and Facebook pages, and other office communications kept me online most of the time. Online and distracted by it. Still a struggle for me to have balance in this area. I don’t want to have that sort of influence on this darling granddaughter, our tinier grandson, or others who will come after. As for our little one’s love of her uncle’s videos? She will still be watching them, just not over and over and over. Fortunately she can also enjoy the music (without benefit of the screens) because we are Patreon patrons of her uncle with his MP3s as perks). Those music files were a great help recently to this tiny girl enduring a long roadtrip. Listening to her favorites, she finally fell asleep.